David Christopher Preston (1918-2014), Solicitor; son of Kerrison Preston. Sitter in 1 portrait. Hugh Graham Preston (1913-1942), Solicitor and second lieutenant, The Rifle Brigade; son of Kerrison Preston. Sitter in 1 portrait. Mary Ursula Preston (1920-1974), Daughter of Kerrison Preston. Sitter in 1 portrait. Phoebe Veronica Romer (née Preston) (1915-1973), Daughter of Kerrison Preston. Sitter in 1 portrait. I see that you have now turned the picture around so it is no longer a mirror image. So, going from left to right, they are now Ursula, Hugh, David, Phoebe. I saw the original print at my mother's house yesterday. Your version is actually a mirror image. We were able to check this because we still have the water-colour that is behind Hugh's "left" shoulder and it has definitely been reversed in your version. I have a photograph of me holding the signed Lafayette print with the same watercolour behind my right shoulder. The small, circular miniature on the mantelpiece is actually a portrait of Phoebe Kerrison, the ancestor who brought the name Kerrison into the family, rather than the Phoebe in the main photograph. My son stumbled across this and forwarded the link to me, asking me if it was a family portrait. So I had a look and was amazed to see a picture that I have seen many times before - my mother has a print of it amongst lots of other old family photographs. Going from left to right they are: Phoebe, David (my father), Hugh, Ursula. Two further daughters, Jean and Angela, were yet to be born. The age order is Hugh, Phoebe, David, Ursula. I think Hugh was born in 1913 (?). After Cambridge he became a solicitor with a view to taking over the family firm of Preston & Redman in Bournemouth. He was killed in Tobruk. Phoebe would have been born in about 1915/16 (?). She was a central figure in Moral Rearmament (MRA) and worked closely with Buchman himself. She met her husband, Frank Romer, through MRA. She died in about 1972 (?) of a rare form of leukaemia. David was born in 1918, three weeks before the armistice. Given Kerrison Preston's keen interest in art (especially William Blake), David would have liked to have become an art dealer. He was taken prisoner in May 1940 and was a PoW when he heard Hugh had been killed. Which meant he had to become a solicitor to carry on the family firm. He died in 2014 two weeks before his 96th birthday, having had four children and six grandchildren. Ursula was probably born in about 1920 (?). She became the nanny to the exiled Romanian royal family in Geneva. She died suddenly of liver cancer in 1974. 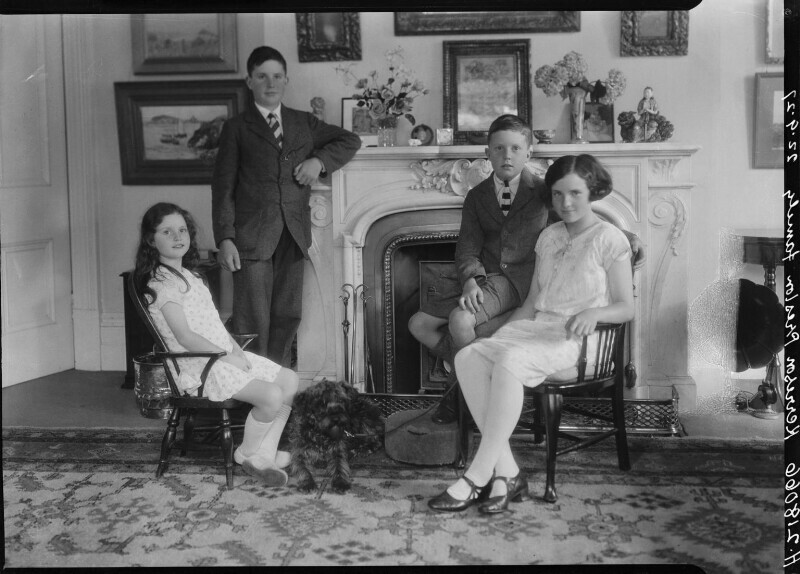 The photograph was probably taken in the drawing room of St Julian's in Knyveton Road, Bournemouth. I was born in the house across the road and I can just remember St Julian's before it was demolished in the 1960s, although my grandparents had moved away long before. I recognise the china figurine on the mantelpiece. Some of the paintings also look familiar, especially the one behind Hugh's left shoulder, although I can't identify it. I also recognise the figurine behind Hugh's right shoulder. The picture on the mantelpiece looks like it might be the one by Arthur Rackham, specially commissioned by my grandfather as a slightly changed copy of a book illustration, although it is very hard to tell due to the reflected light. I think the small circular picture might be a miniature portrait of Phoebe as a baby. I don't know the name of the dog. I know that Phoebe and my father were great cat lovers and the two of them formed the very exclusive Cat Club with its own secret signs. As much as anything this was a way of excluding Ursula and ganging up on her. Families, eh? A bit of family folklore: In the 1960s during a game of Odd-One-Out my brother, then aged about 6, chose Ursula. Nobody could guess the reason. Eventually, in all innocence, he revealed that it was because she was the only one who had a moustache! She took it in very good humour.